One of the most influential make up artists in the world, Rae Morris has written the book on beauty (in fact, she’s written several of them…) Having perfected endless famous faces, she turned her hand to creating the most luxurious and effective brushes money can buy – and the results will change the way you apply make up forever. Perfect for bronzer, blush and all-over powder (in both cream and powder formulations) Rae Morris says: ‘If you only have room for one brush, this is it.’ Meticulously crafted by Japanese artisans, the brush features a subtly tapered head, a super-sleek handle and the brand’s world-first magnetic storage functionality (‘Jishaku’ means magnet in Japanese) for seamless storage and perfect hygiene. From its supremely soft head to its ultra-sleek handle, Rae Morris’ Jishaku brush range will change the way you apply make up forever. Combining the finest Japanese brush-making techniques and Rae Morris’ make up application expertise, this range is the culmination of years of testing and perfecting. Jishaku #1: Deluxe Kabuki is best suited to all-over powder, bronzer and blusher applications (both cream and powder formulas, FYI). 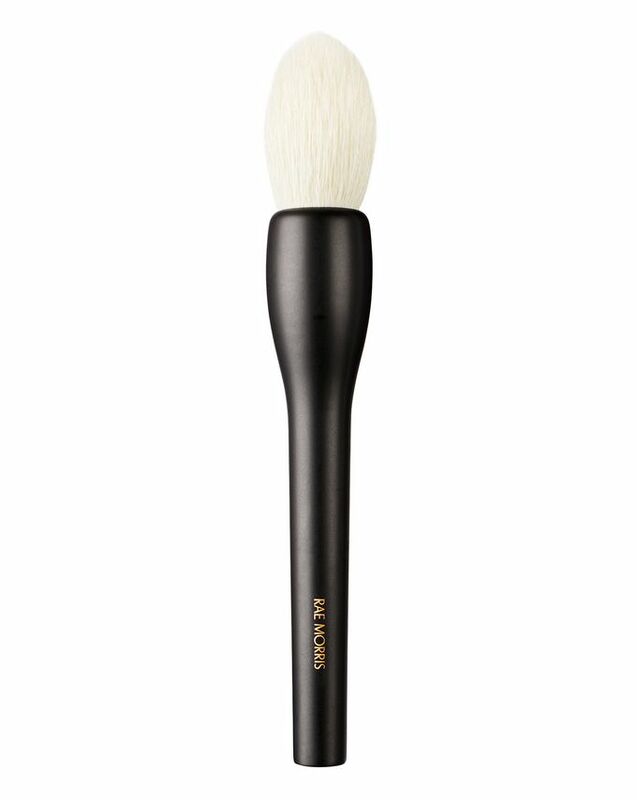 This gorgeous multi-tasking miracle also doubles as a contouring brush. With gentle pressure, it’s perfect for fine blending and contouring; increasing the pressure slightly, it’s precise yet soft enough for blusher application. The beautiful brush head is meticulously crafted from the highest grade Hakutotsuho goat hair by Japanese artisans (animal cruelty-free and deemed the ‘softest I’ve ever had’ by a discerning Into The Gloss reviewer) while the sleek black handle is formed from hard maple and cherry wood. Another standout feature is the brand’s world-first magnetic functionality (‘Jishaku’ means magnet in Japanese) which means that the brushes can stand upright on any surface a magnet will hold to – including Rae Morris’ custom designed magnetic stands – making for seamless storage, ultimate organisation and perfect hygiene. Top tips from this exquisite brand itself? ‘If you only have room for one brush, this is it. It crosses all boundaries - from blush to powder, from cheek to contour.’ We’re sold! Use to apply all-over powder, bronzer and blusher – it’s perfect for both cream and powder formulations. When I opened my package, I was very surprised by the size - it is so much smaller than I’d expected. It is described as a brush for blusher, bronzer and all-over powder. I had expected the brush head to be bigger. I was going to drop a star for that, however, I have been testing it out and it does do everything it is supposed to. This brush is beautifully soft, it blends with ease and is multifunctional. I bought this because of the deal where you get the Rae plate free and oh my God was I was not disappointed! The magnetic plate and brush system? Unreal. Why did no one think of this earlier?!? And the brush itself? The handle is so smooth, the brush is so perfectly balanced, the hair is so soft and so fine. It beats my old MAC blusher brush any day, which now sits there, discarded and unused ever since this baby came along. The only problem is now I want to buy the whole set and replace my brushes with these. They are *that good*. The quality is very good, the grip is comfortable, the hairs are excellent in grabbing powder, and the way it lays it down is excellent. It can be used as a powder brush, a blush brush or even a partial highlight. It is a multi-functional brush.